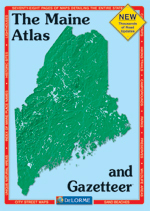 The larger map is in the Adobe Acrobat Reader Format and includes all cities and towns in Maine. You must have the Adobe Acrobat Reader program installed on your computer to view this file. You may print the larger map for personal use. Any use of the above map or the larger map (PDF file) for commercial purposes is strictly prohibited. Interactive maps of Maine towns and cities, airports, state parks and tourist attractions.